Click here for audio of Episode 1712. Today, Florence Nightingale draws a graph. The University of Houston's College of Engineering presents this series about the machines that make our civilization run, and the people whose ingenuity created them. In 1853, Turkey declared war on Russia. After the Russian Navy destroyed a Turkish squadron in the Black Sea, Great Britain and France joined with Turkey. In September of the following year, the British landed on the Crimean Peninsula and set out, with the French and Turks, to take the Russian naval base at Sevastopol. What followed was a tragicomedy of errors -- failure of supply, failed communications, international rivalries. Conditions in the armies were terrible, and disease ate through their ranks. They finally did take Sevastopol a year later, after a ghastly assault. It was ugly business all around. Well over half a million soldiers lost their lives during the Crimean War. One true hero emerges from all that. Florence Nightingale had few of the warm and fuzzy edges that surround her image. She was a tough, tireless, and fiercely intelligent organizer, who fought all her life to create humane care for the sick and wounded. In 1858, Nightingale wrote her Notes on Matters Affecting the Health, Efficiency and Hospital Administration of the British Army. In it, she created a remarkable and original graphical display to show us just what'd really gone on in the War. 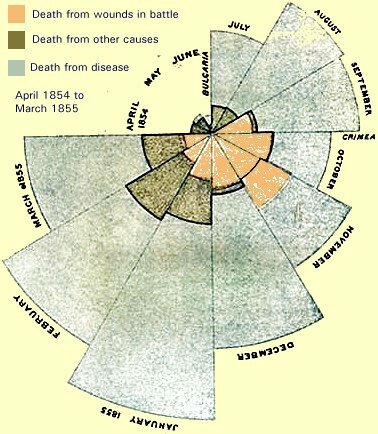 It was a Polar-Area Diagram that showed how people had died during the period from July, 1854, through the end of the following year. The graph is a lesson to any engineer in how to present data -- not only so that it's clear to any reader, but to reveal the big picture as well. Nightingale's graph is like a pie chart, cut into twelve equal angles. These slices advance in a clockwise direction. Each shows what happened in one month of one year. The outward reach of each slice shows how many deaths occurred in that month. We see little short slices in April, May and June of 1854. After the troops land in the Crimea, the slices begin reaching far outward in the radial direction. There's more: Each slice has three sections, one for deaths from wounds in battle, one for "other causes", and one for disease. Except for the bloodiest month in the siege of Sevastopol, battle deaths take up a very small portion of each slice. Even the awful Charge of the Light Brigade yielded only a modest fraction of the total deaths in that month. Once you see Nightingale's graph, the terrible picture is clear. The Russians were a minor enemy. The real enemies were cholera, typhus, and dysentery. Once the military looked at that eloquent graph, the modern army hospital system was inevitable. You and I are shown graphs every day. Some are honest; many are misleading. Nightingale could, for example, have scaled deaths according to the radius, instead of the area, of the segments. That would've strengthened her case. But it would've misled people, since area is what the eye sees. 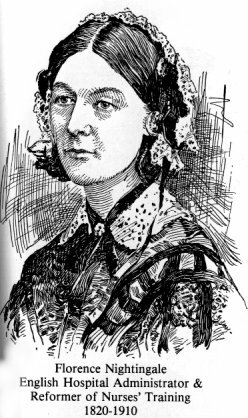 So you and I could use a Florence Nightingale today, as we drown in more undifferentiated data than anyone could've imagined during the Crimean War. Nightingale, F., Notes on Matters Affecting the Health, Efficiency, and Hospital Administration of the British Army. Founded Chiefly on the Experience of the Late War. Presented by Request to the Secretary of State for War. Privately printed for Miss Nightingale, Harrison and Sons, 1858. For good accounts of the Crimean War, see any edition of the Encyclopaedia Britannica since that war. Modified image of the first of the two Coxcomb Charts provided by Florence Nightingale in Notes on Matters Affecting ... 1858.